"The rise of Steam has lead to a lot of obscure Japanese games finding new audiences in the west. 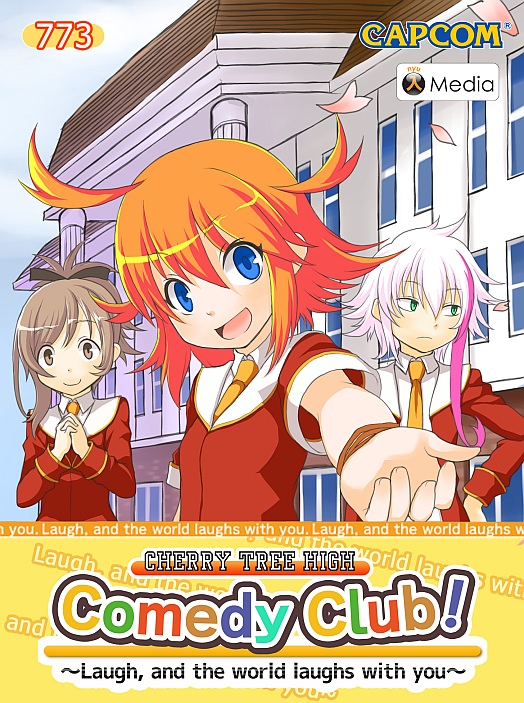 While Recettear is the most notable name among these, another that tends to pop up in conversation is Cherry Tree High Comedy Club! It's a sort of adventure game/visual novel that's modest in scope, but charming in its simplicity. It's also about subject matter not normally explored in games at all; stand-up comedy. Well, sort of. The game uses that as a jumping off point for its real themes, resulting in a game oozing with personality. It's also a great example of how different comedic sensibilities between western and eastern tastes are. The story starts at the beginning of Japanese spring break, as Mairu Hibisu returns to town and her high school, fresh off some unseen adventure. She wants to resurrect the school's old comedy club, which gave birth to a popular comedic duo many years ago, but her rich rival Chitose has other plans. Now a member of the student council, she's not willing to let Mairu bypass the rules to establish a club, stating that she has until the end of April to gather together three more members besides herself and her best friend Hoemi, or else the club won't be officially established or funded by the school. So, the goal now is to scout out possible club members across town, then convince them to join..."
After enough complaints, the translation was fixed to use proper Japanese terminology, causing several of the cultural jokes to suddenly make sense. Playing the game in Steam allows you to switch between the proper localization and the westernized version whenever you start back up, an admirable attempt to please those who liked the original translation regardless. However, a few lines here and there still read as the westernized version while playing the proper translation, such as Hoemi calling Mairu 'Miley' when you talk to her in the dorm room. Thankfully, these moments are only in basic dialog when you start talking with someone." "Comedy fanatic and high school student Miley Verisse has decided to set up a comedy club in her school, but her nemesis and the head of the student council, Octavia Richmond, isn’t about to make things easy… The school rules require a minimum of 5 students to set up a new club and Miley is 3 people short! Spring break has just started and Miley has until the end of April to recruit the 3 new members she needs to start the club or Octavia will have the last laugh! The game takes on a very Persona-esque look and feel of the social linking done in that series, but with a style that's completely surrounded around that. Published by Capcom, the translation was helped on by part of the Team that did the translations for the Ace Attorney series, and the tone they bring fits the game perfectly. This game isn't free, but worth checking out for people who are particularly interested in visual novels as most of what you do is explore, interact, and manage your time. You can check out the games Steam page here. You can check out the games official website here."